This anchor chart poster is a great tool to display in your classroom or hand out to students to put in their notebooks or binder. Students will be be able to compare open circle vs. closed circle. 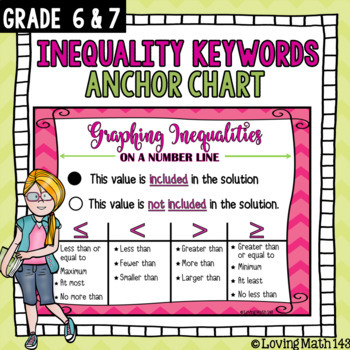 The anchor chart includes important key words to determine if the inequality should be: greater than or equal to, less than or equal to, greater than, or less than. If the inequality symbol is "greater than" or "less than" then the graph will be an open circle. If the inequality symbol is "greater than or equal to" or "less than or equal to" then the graph will be a closed circle. I constantly find my student's referring back to the anchor chart as a reminder. 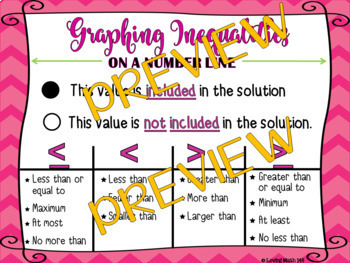 GET THIS ANCHOR CHART BY PURCHASING MY MATH ANCHOR CHART BUNDLE! CHECK IT OUT HERE! This anchor chart can be printed on a regular 8.5 x 11 inch printing paper and placed in student notebooks, or printed as a half-page making an excellent resource for students interactive notebook. You can also scale the PDF file and print it on poster size paper and display it within your classroom. That is how I use my anchor charts.